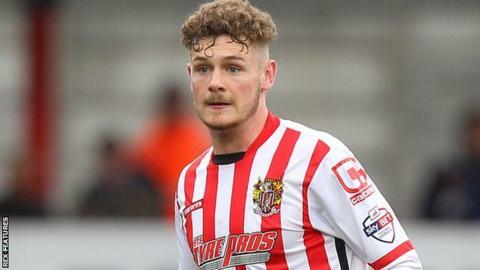 Stevenage boss Teddy Sheringham says Ben Kennedy could force his way into the Northern Ireland squad for Euro 2016 if he keeps up his good form. The 18-year-old midfielder has played 25 times for Stevenage in 2015 and has impressed in recent weeks. "They don't have an abundance of players, so anyone who does do well will certainly be in and around their squads," Sheringham said. "If Ben progresses how we hope he will, then come May who knows?" The playing style of the Northern Ireland youth international has been likened to Sheringham's former England team-mate Paul Gascoigne. "Gazza came on the scene and he was 'wow', and I use him as an example about my career as I just didn't come on the scene like that," Sheringham told BBC Three Counties Radio. "You have to grow and learn all about your game and what you can and can't do on the pitch. "Ben's very similar to that, but he still can learn. I've been around enough top footballers and exceptional footballers to understand what's going on in his thought process as he's looking to get the ball, as he's looking to receive the ball and as he's striking the ball. "He's an intelligent player, a very clever player." Are Spain over World Cup hangover? Read more on Euro 2016: Are Spain over their World Cup hangover?